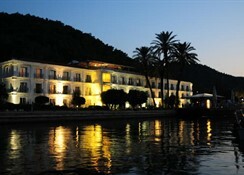 The Ece Saray Marina & Resort Hotel is a grand hotel built in the style of an Ottoman palace summer residence, and in a perfect seafront position, close to the heart of Fethiye town. This 5 Star boutique style hotel has been designed and built by the best craftsmen and boasts displays of ceramic art, exquisite carpentry, imported Brazilian marble floors, striking stained glass walls, fragrant landscaped gardens, and 48 spacious standard rooms and suites with stunning sea views. 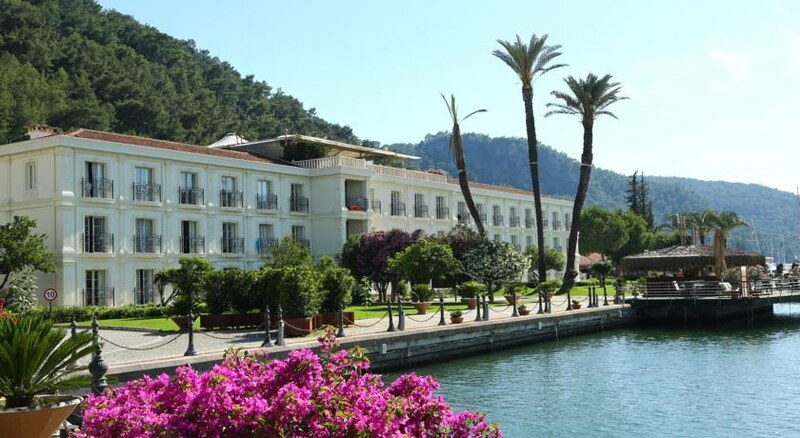 Guests to the Ece Saray Marina & Resort Hotel are close enough to the centre of Fethiye to get out and about and explore all the region has to offer, as well as experience some true Turkish hospitality, fine dining and a luxurious stay. 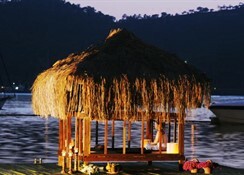 Getting there: Dalaman International Airport (DLM) is 30 km from the Hotel. 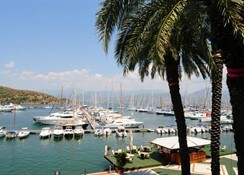 Local Tips: Fethiye is now a vibrant holiday destination packed with bazaar-style shops, restaurants, cafes and bars. The Ece Saray Marina and Resort Hotel is in a perfect position for wandering around Fethiye town centre, the harbour and the ruins of the Lycian Rock Tombs, and if your interested in the local history, the old deserted 'ghost town' of Kayakoy built in the 18th Century, just 8km away. Food, drink and entertainment: Bed and breakfast accommodation with an option for Half Board. There is a rooftop dining room with superb views, serving a rich buffet breakfast, patisserie, cafeteria, lobby bar, snack bar, pool bar, roof bar, terrace bar and restaurant bar. A wide range of cuisine is offered over at the Levante Restaurant with a beautiful alfresco setting over the sea. Lunch can be enjoyed at the pool bar directly next to the large pool with Jacuzzi or in the Bayside Snack on the waters' edge. Sports, games and activities: Outdoor swimming pool with jacuzzi overlooking the bay, children's pool, Turkish bath, sauna, massage, Jacuzzi, health & beauty centre, SPA and fitness centre. Please note: Outdoor pools will be closed during winter months -31st Oct until 15 April. Pools may also be closed during April, depending upon weather conditions. 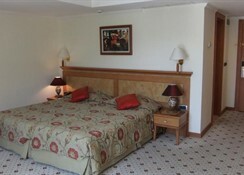 Additional: 24 hour reception, central air-conditioning and heating, wireless internet connection throughout the grounds of the hotel and business centre, hairdressing salon, laundry and ironing services, dry cleaning, 24 hour room service, power generators, doctor and nurse on demand, baby sitting, tours, airport transfers, car hire services, well equipped meeting and conference rooms for large and small gatherings and weddings. The Ece Saray Marina & Resort Hotel features 48 individually designed rooms and suites, all with magnificent sea views, and equipped with direct dial telephone, music system, fully stocked mini-bar, safe box, wireless Internet connection, Satellite TV, central air conditioning and central heating, bathtub and power shower, WC, hairdryer, tea and coffee making facilities, sea views and Parisian balconies with French doors. Suites have whirlpool baths offering hydro-massage. Free baby cot available on request.